In a thrilling come from behind victory, the UCF Knights took down the Memphis Tigers on the road, 31-30. It was UCF’s third win over Memphis in the last two seasons. After dominating every opponent they had faced this season, the Knights faced their first real test of 2018 on Saturday night. The defense had a rough first half, allowing 30 points as the offense sputtered as well. But as rain began to pour in the second half, UCF doubled its effort and held Memphis scoreless in the final two quarters. The Tigers had a last minute chance to win the game, getting the ball back down by just one. But Memphis failed to score before time expired, giving UCF a narrow victory. 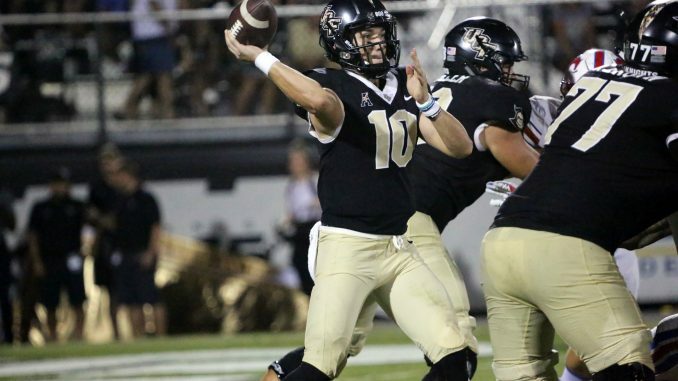 Star quarterback McKenzie Milton, despite up-and-down play, finished with 296 yards and one passing touchdown to help the Knights to the win. UCF has now won 19 games in a row, which is the longest streak in the nation.